Best iPod Touch to Mac Transfer, transfer music/video from iPod to Mac. Transfer music, videos, photos, podcasts and TV Shows. Transfer files among multiple iPods (iPod to iPod) at one time. File transfer from iPod to iTunes. Fully supports iPod touch FW 3.1, iPod nano 5G FW , iTunes 9. Manage your iPhone or iPod touch like an external hard drive. iMacsoft iPod to Mac Transfer is powerful and best Mac iPod/iPod Touch transfer software which makes it much easier to manage your iPod freely, It can fast transfer, copy and manage your music, video, digital photo, podcast and TV program from your iPod to Mac, iPod to iTunes, iPod to iPod and Mac to iPod Touch transfer is also available. It is the ideal solution for backing up your iPod contents. 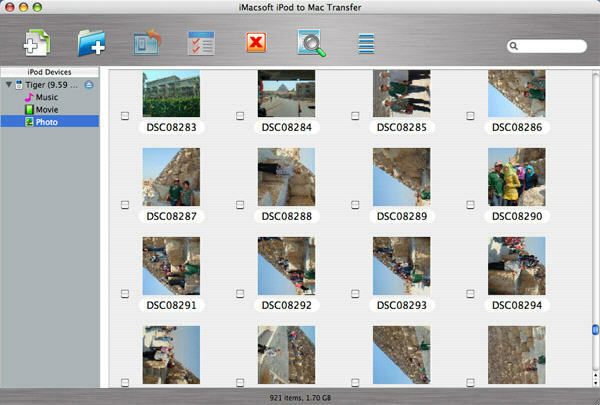 Moreover, iMacsoft iPod to Mac Transfer helps you create, edit and delete iPod playlists. With the professional iPod to Mac transfer software, you can copy files among multiple iPods at one time. With installation of iTunes, iPod to Mac Transfer can even transfer music, videos, photos and so on between your iPhone and iPod. iPod to Mac Transfer can manage your iPhone or iPod touch like an external hard drive. Also you will find that quick search and filter tools help you hit what you want as easily as iTunes does. iMacsoft iPod to Mac Transfer supports all types of iPods including iPod classic, iPod nano, iPod nano 5G, iPod touch, iPhone, iPhone 3G, iPhone 3GS and so on. Your iPod, your way. iPod to Mac Transfer provides an ideal solution for you to manage, rip, copy, backup iPod or iPhone on Mac. Fully supports latest iPhone OS 3.1, iPod touch FW 3.1, iPod nano 5G FW 1.0 and iTunes 9. Transfer iPod songs, videos, photos, TV Shows from iPod or iPod touch to Mac at high speed. Transfer any Files from Mac to iPod, Easier than iTunes. Connect multiple iPods and one iPhone all together with this iPod to Mac transfer software and then transfer files amongst them by drag-and-drop. Open your iPod/iPhone with Mac OS Finder to make you manage it as a portable hard disk. Support managing 26 iPods and one iPhone at the same time. automatically transfers your iPod and iPhone music, video, photos, playlist back to Windows Computer and iTunes. Copyright © 1998-2010 Share2.com All Rights Reserved.